The Ultimate Dilution Solution. Teroforma designed Wine Twirls with wine lovers in mind. If you love enjoying a chilled glass of wine, then you're familiar with the age-old problem of trying to keep your wine at fridge temperature without having to dilute with melting ice. Teroforma, the original Whisky Stone maker, has brought their expertise to the wine world with their invention of Wine Twirls. Wine Twirls are designed to mimic ice cubes in functionality but without the worry of having your ice melt and dilute the flavor of your favorite pour. Simply freeze your wine chill drops for 3 hours prior to use and drop into your glass of chilled wine to enjoy an extra 30 minutes of fridge temperature wine. Drinking a glass of room temperature wine? Drop in 2 Wine Twirls and enjoy a chilled glass in minutes! STAYS COOL & TASTY - Pour a glass of your favorite chilled wine and place a Wine Twirl inside to keep it fridge cold for up to 30 minutes so you can enjoy a glass of wine outdoors without worrying about dilution. 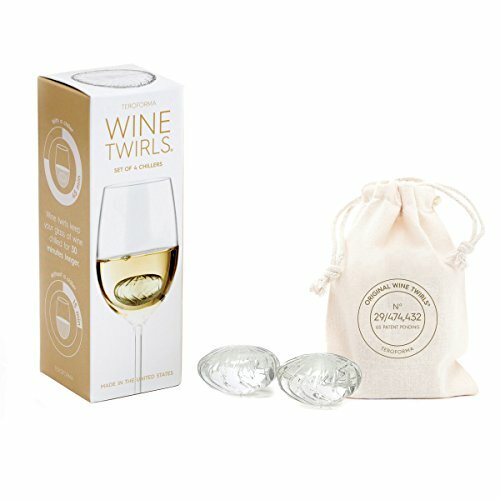 REUSABLE - Unlike ice, Wine Twirls are designed for more than one drink. When not in use, simply rinse by hand, allow to air and freeze for at least 3 hours before use. SIMPLE YET ELEGANT - Wine Twirls are all about their beautiful and useful design. The unique shape sinks gently to the bottom, keeping your glass of wine at fridge temperature without having to use unsightly ice cubes. FDA APPROVED, FOOD GRADE SAFE - Teroforma 1.75" wine pearls are proudly made in the USA from BPA-free food-safe resin & high-tech thermal gel so you don't have to worry about contaminating your favorite pour. IDEAL WINE GIFT - Brighten up any wine lover's day with Wine Chill Drops from Teroforma. Each package includes 4 Wine Twirls, enough for you and your company to enjoy a glass of your favorite pour. If you have any questions about this product by TEROFORMA, contact us by completing and submitting the form below. If you are looking for a specif part number, please include it with your message.